The City of New Orleans, Louisiana. The City of Louisville, Kentucky. A beautiful 1855 first edition example of Colton's rare two part map of New Orleans, Louisiana and Louisville, Kentucky . Map is divided into two sections. Both are hand colored in pink, green, yellow and blue pastels to identify city wards. Both maps also offer extraordinary detail at level of individual streets and buildings. Both maps are drawn to the same scale. Surrounded by Colton's typical spiral motif border. 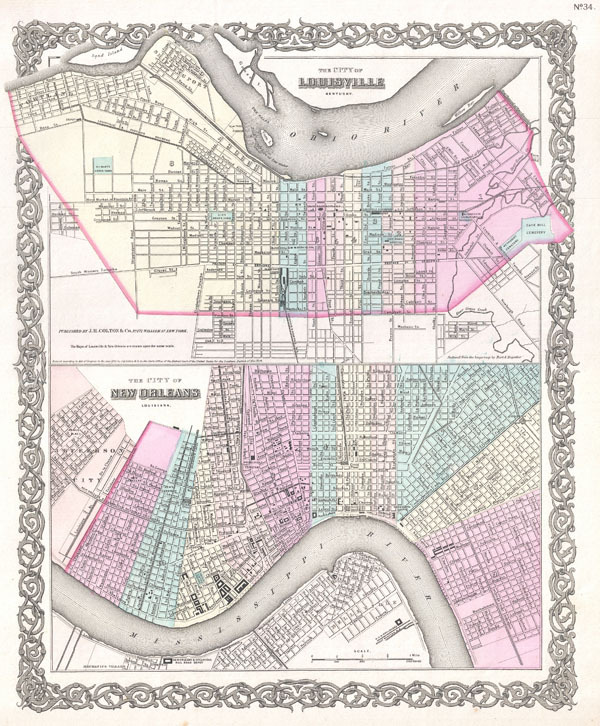 The lower map, New Orleans, Louisiana, covers from Jefferson City to Benefit Street and from MacDonogh to Dolhonde Street. In addition to all major streets, this map identifies the New Orleans and Opelousas Rail Road Depot, Mechanics Village, Annunciation Square and Claiborne Canal. The upper map, Louisville, Kentucky, covers from Portland to Cave Hill Cemetery and from Oak Street to the Ohio River. Identifies the Louisville and Frankfort Depot, the City Marine Hospital, the St. Vincent Orphan Asylum, the City Graveyard, St. Mary's Graveyard, City Hall, the Court House, and the Medical College. Dated and copyrighted to J. H. Colton, 1855. Published from Colton's 172 William Street Office in New York City. Issued as page no. 34 in volume 1 of the first edition of George Washington Colton's 1855 Atlas of the World. Rumsey 0149.040 (1856 edition). Phillips (Atlases) 816.